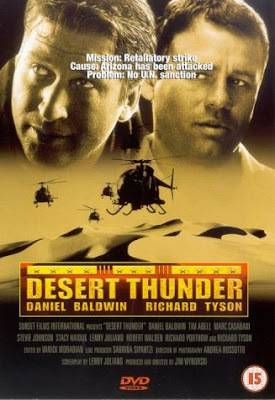 Desert Thunder is a surprisingly enjoyable outing from Jim Wynorski. By the box art you would think it's a dry and serious affair. In fact, it is an upbeat and downright lighthearted experience. 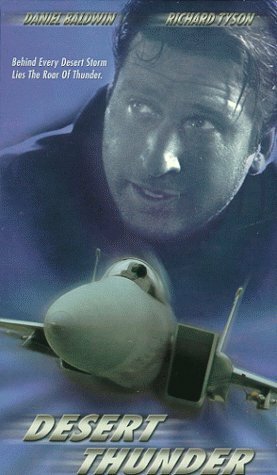 Daniel Baldwin plays Lee Miller, a fighter pilot with a dark past. 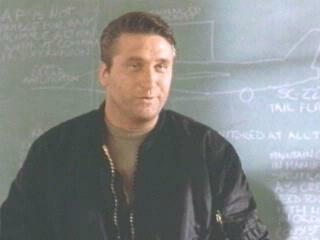 He is put in charge of assembling a team to fly to Iraq and stop a missile that will destroy a major city in Europe. The ragtag team are all outcasts from the military but Miller and his right hand man, Streets (Tyson) must unite them towards one common mission. Besides Miller & Streets, the team, called "The Shadow Dancers" consists of: Burkett (Tim Abell), the hothead, Detolla, the silly chef who provides most of the comic relief, Jones, a record producer, Hasheem, A political refugee and computer nerd, and Malone, a woman who was involved in a military scandal. Will they survive each other before they can take down the wacky Iraqis? If you watched this in 1999 it would seem "ripped from the headlines". The evil Iraqis brag about stalling U.N. weapons inspections. They say the WMD's are hidden in the palaces "where the Americans can't touch them." This is a direct slam on Hans Blix. You got burned, Blix! Daniel, one of the more underrated Baldwins, puts in an engaging performance. Miller calls people he doesn't know "Slappy" or "Sparky" and he is a compulsive gambler. Tyson is stoic as Miller's foil. They have to oversee the many training sequences, barroom brawls and food fights that pad out the running time. It is suspected that 'Thunder contains stock footage, but this couldn't be definitively confirmed. Speaking of recycling, one pilot's airplane handle is "Eagle One", which is used in another Roger Corman production, The Hunt For Eagle One (2006). Not only does Desert Thunder resemble the movie Top Gun (1986) but also the NES game "Top Gun", as shown in the Nintendo-type screen in the planes and the usage of the term "bogeys". 'Thunder contains all the clichés you know and enjoy, mixed together with an uplifting patriotic theme, some goofy humor and some explosions. It all adds up to a rousing good time!